Objectives: Intra-gastric balloons are devices used in many foreign countries as a bridge to bariatric surgery. Regulatory oversight differs from country to country leading to inconsistency in patient evaluations and procedural techniques. Often a United States (US) physician’s first exposure to these devices is generally upon arrival of a patient presenting with device related sequelae. 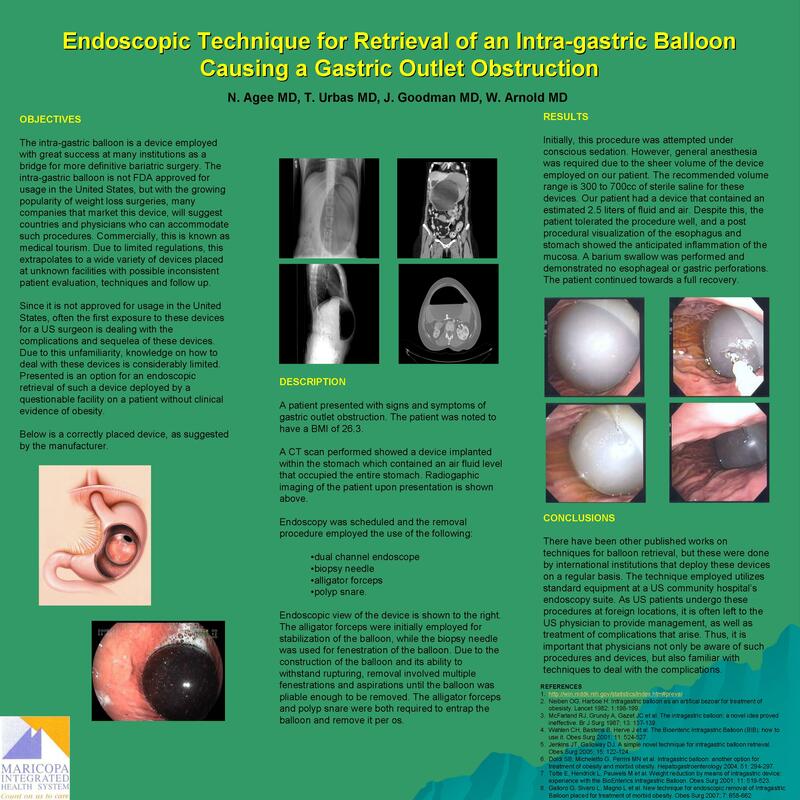 Presented is an option for endoscopic retrieval of such an intra-gastric balloon. Description: The patient presented with signs and symptoms of gastric outlet obstruction. Body habitus was within normal limits. CT scan showed an implanted gastric device containing fluid and air occupying the entire stomach. General anesthesia was required to perform an esophagogastroduodenoscopy using a dual channel scope. Alligator forceps were used to stabilize the device to allow for deflation. Multiple fenestrations with a biopsy needle were required. The device was removed using the forceps and a polyp snare. Of note is the fact that the recommended volume for these devices is 300 – 700cc, yet our patient’s balloon contained 2.5 liters of air/fluid. Results: The patient tolerated the procedure well and a post procedural barium swallow was negative for perforations. The patient experienced a full recovery. Conclusion: International institutions utilizing these devices have published a couple techniques for retrieval. The technique described here utilizes a standard US community hospital. Manufacturers of these balloons provide information to patients on countries and providers thus promoting medical tourism. With this trend, the chances for US physicians being confronted with complications increases. It is important that physicians not only be aware of such procedures and devices, but also be familiar with techniques to deal with the complications.